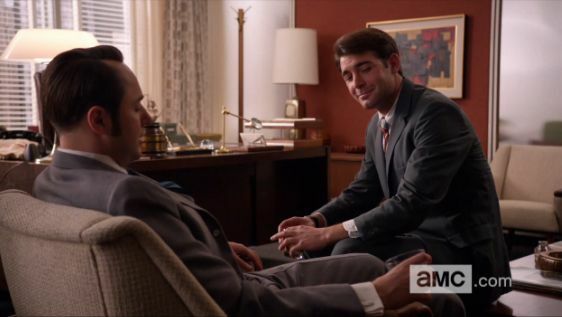 Puddles of Myself: Puddles of My Mad Men Season Six: "Favors"
Bob Benson is not gay. He’s just a liar. Now, I may be proven wrong about both of those statements over the next two weeks or by this time next year, when Mad Men’s final season concludes, but right now that’s what I believe. And if you pay attention to Bob Benson’s face as he leaves Pete’s office—a mix of confidence and “he bought it” adrenaline—I think you’ll agree with me. However, it doesn’t matter if Bob Benson is gay. It might be a red herring or it might not; either way, sometimes it’s just more important to enjoy a story, whether a television show or a novel, rather than get to the bottom of what it all means, or to definitively know the motives or sexual orientations of a specific character. Last week, in the wake of the helmetless Daft Punk photo, Emily Yoshida wrote a post on Grantland about our current desire to find out as much as possible about celebrities and artists at the risk of losing the sense of mystery in the world. It was a solid article that raised some good points and I happen to agree with her on this issue. While we undoubtedly live in the era of oversharing, that doesn’t necessarily mean we should embrace the complete loss of mystery. He told Ken in the season premiere that his father was dead. He told Pete in “The Better Half” that his father was sick but had recovered. In “A Tale of Two Cities” he told Ginsberg that he wasn’t gay. And, also in “A Tale of Two Cities,” he told Ted Chaough that he convinced Jim Cutler to let him go to the Manischewitz meeting. In “Favors” he led Pete to believe that he was gay. I was actually surprised when I did my weekly Mad Men recap reading and saw that all of the recappers that I respect and admire each openly accepted the fact that Benson was gay. As a fan of the show, that doesn’t seem like Matt Weiner’s style. It just seems too obvious and too easy for things to be that cut and dry. And, besides, as I said, it shouldn’t really matter. Enjoying the show in hour increments and slowly finding out if the mystery is actually revealed is more important than whether or not Bob Benson is gay. And if he ends up simply being a liar, is that so far fetched either? At Vulture, Matt Zoller Seitz did a great job of comparing Don’s history of sociopathy and lying with Bob Benson’s own brand of sociopathy and lying and showing how the two overlapped and also differed. Bob seems to act and lie in order to discover others’ needs and desires, which then allows him to get ahead or to blend in. Meanwhile, Don is skilled at lying and figuring out what other people think they want or need to hear in order to further his own desires and sense of ego. Each brand is similar, but they differ in key ways. Bob Benson knows that Pete is looking for someone to blame for his mother openly discussing topics that are “perversions.” When someone’s parent is suffering from dementia or is rapidly fading from the parental figure they once were (whether you liked that parent or not), it is a difficult and painful thing. Could it just be that Bob Benson recognized that’s what Pete wanted and, in an effort to provide that scapegoat and help Manolo (whatever their connection may be), decided to play the role of the gay man in that moment? And why isn’t Bob Benson lying? The major event of this episode involved Don getting caught in a lie by his daughter. Don was lying to himself in imaging that his affair with Sylvia could continue on much longer—he just wanted to cash in on his favor. Then, Sally catches him and he is forced to lie to her. Except it’s a lie that she’s not likely to believe. “It’s complicated,” isn’t an explanation an intuitive teenager like Sally will take on face value. Sure it seems a little too convenient that Sally walked in on her father after she walked in on Roger and her step-grandmother in last season’s “At the Codfish Ball.” Maybe it was a distant kind of Chekovian foreshadowing. Whether it totally works or not, is not the true point. The true point is that Sally and Don now share a secret. Don is now asking he own daughter to silently do a favor for him. The phrase, “People make mistakes, right?” though it may be one of the most honest things Don Draper has ever said, is not the kind of ground you necessarily want to be on with your daughter.